The manufacturers and products we have selected to work with have been chosen after careful consideration. We have selected only those products that offer high quality, a wide range of product styling & features, state-of-the-art finishes, and virtually limitless custom capabilities. You will be favorably impressed when you experience first hand our large selection of custom cabinetry. From country to traditional to contemporary to modern, the home of your dreams can become a reality with River North Cabinets. 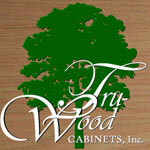 Founded in 1990, Tru-Wood® Cabinets, Inc. specializes in the manufacturing of fine "all wood" Kitchen, Bath, home office and other room cabinetry, together with a complete line of closet organizers. Tru-Wood®cabinets are handcrafted With the most attention to quality, workmanship, design details and the best value for our customers around the eastern half of the continental U.S.